Caption slip reads: "Photographer: Gaze. Date: 1952-06-13. Reporter: (caption only). Assignment: Yucca plants. 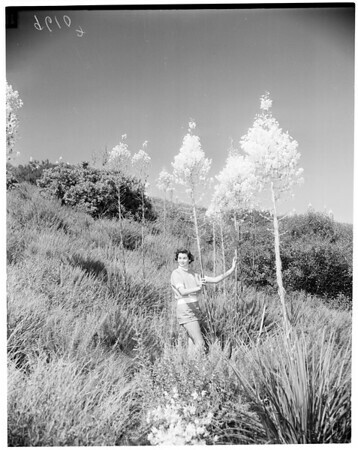 17/18/29/30: Peggy Taylor, Santa Monica City College student, stops in Santa Monica mountains to admire yucca blossoms. Above average rainfall in mountain areas during past season is said to be responsible for heavy increase in number of plants".